Have you ever dreamt of the perfect Charlottesville home theater installation? Most homeowners have. That’s because there is nothing quite like going to the movies and losing yourself in a world of action, adventure, or comedy with those you love. In fact, the only thing better might be enjoying all of that, but with premium sound and video, all in the comfort of your own house. Ask any of our satisfied clients, and they’ll tell you that the Fredericksburg best home theaters offer a safe, relaxed way to enjoy cinematic greats in style. 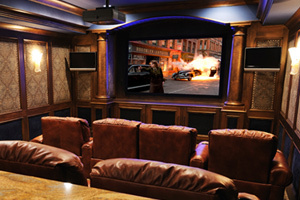 Contrary to what they’ll tell you in a big-box store, however, Washington DC home theater installations are about more than just buying a bigger TV and connecting a few wireless speakers. You want the very best, which means high-end performance, comfort, and style. That’s why Appalachian Home Technologies work with our clients to design Richmond VA best home theaters that have the perfect size and specs for our clients’ homes. We’ll work with you to find the best picture and sound for your budget, and then package and install them in a way that makes enjoying movies a snap. Because we program everything for your needs, all you have to worry about is giving us your preferences and enjoying our work. There are a lot of stores and contractors who say they can help you with Fredericksburg home theater installations, but no one stands by their work like the team at AHT. If you want to start enjoying movies, TV, and even live sporting events with the highest degree of comfort and safety, talk to us about building one of Charlottesville’s best home theaters today.